We are thrilled to announce the public preview of low-priority virtual machines (VMs) on VM scale sets. Low-priority VMs allow users to run their workloads at a fraction of the price, enabling significant cost savings. This offering has been available through our Azure Batch service since May 2017, and because we have seen great customer success we are expanding it to VM scale sets. This is a great option for resilient, fault-tolerant applications as these VMs are allocated using our unutilized capacity and can, therefore, be evicted. Low-priority VMs are available through VM scale sets with up to an 80 percent discount. Low-priority VMs enable you to take advantage of our unutilized capacity. The amount of available unutilized capacity can vary based on size, region, time of day, and more. When deploying Low-priority VMs in VM scale sets, Azure will allocate the VMs if there is capacity available, but there are no SLA guarantees. At any point in time when Azure needs the capacity back, we will evict low-priority VMs. Therefore, the low-priority offering is great for flexible workloads, like large processing jobs, dev/test environments, demos, and proofs of concept. Low-priority VMs can easily be deployed through our VM scale set offering. There is a new property field, allowing you to easily set the priority to low at the VM scale set creation time. If set, then VMs in the scale set will be low-priority. 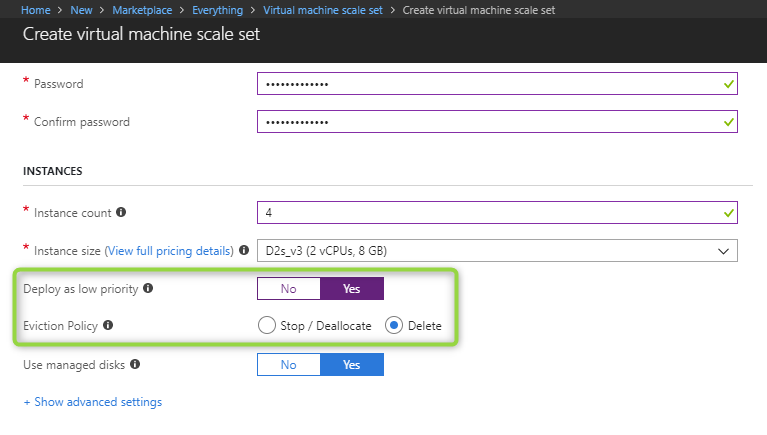 You can create low-priority VMs on scale sets using the Portal, Azure CLI, PowerShell, and Resource Manager Templates. Eviction Policy: When provisioning low-priority VMs, you can set the eviction policy. The two evictions policies that are supported are stop-deallocate on eviction and deleted on eviction. Stop-deallocate on eviction allows users to maintain the disks associated with these VMs. Users can try to restart the low priority in the scale set but remember, there are no allocation guarantees. The delete on eviction policy deletes the VM and all disks associated to the VM. This allows you to save on costs as you will not continue to pay for the disks. Notifications (coming soon): Users can opt-in to receive in-VM notifications through Azure Scheduled Events. This will notify you if your VMs are being evicted and you will have 30 seconds to finish any jobs and perform shutdown tasks prior to the eviction. Low-priority VMs are available in all Azure regions. All size families are supported except for B-series and Dv2 Promo Series. Learn more about our low-priority offering on VM Scale Sets. Learn more about our low-priority offering on Batch. Check out the low-priority pricing.